How is Rolfing different than massage or chiropractic? I heard Rolfing is a 10-step process. Do I have to do all 10? What comes after the 10? Where can I find more information about Rolfing? Rolfers see the body, not as independent pieces, but as a series of interactive relationships. Often, where it hurts is not where the pain is coming from. 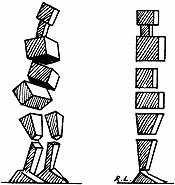 Rolfers try to get to the root the pain by addressing a body's structural imbalance in relation to gravity. This understanding of the body's architecture, combined with unique methods of manipulating soft tissue, is what makes Rolfing different. You will know in one session if Jeremy's work is right for you. Rolfing can be intense; with corresponding intense results. Most clients report feelings of good pain. Rolfers are highly trained in touch and are very sensitive to how much pressure to apply to obtain optimum affects and safety. The work is always done within a client's tolerance. Rolfing is based on the work of Dr. Ida Rolf, a PhD in biochemistry. She developed the work to be used in a 10 session system which helps to balance the whole body in an integrated way. Each session of the 10 series is very different, with different goals, but work together and have a powerful effect on the overall balance of body and mind. Many clients continue to work with a Rolfer after the 10 series, and sometimes "spot" or "fix-it" work is beneficial even before beginning the 10 series.